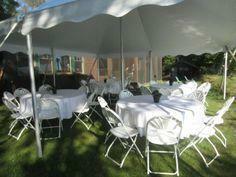 This tent package consists of (1) 20x40 Cable Frame Tent, (8) 5' Rounds, (64) White Fanback Chairs. 800sq.ft of shaded dry partying area. **Pole tents must be staked into the ground and can be placed on pavement.Please in customer comments specify grass or concrete.